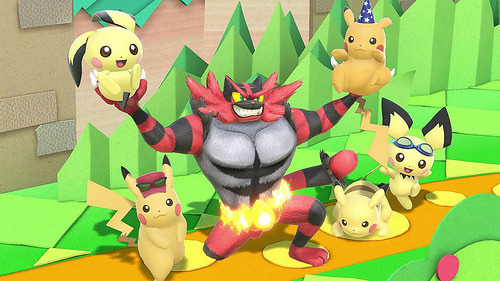 Suggested by Sonic Incineroar is a pretty powerful Pokemon and the latest character from that franchise to join the prestigious Super Smash Bros franchise. His Revenge mechanic works a lot like Rage and allows his strength to be increased. It is conceivable that he is more powerful than Pikachu. Fortunately this electric mouse has a lot of speed on his side and won’t be getting hit very easily. Power doesn’t matter if your blows don’t connect and that’s what is going to happen here. Pikachu wins. This entry was posted in Battles, Incineroar Battles, Pikachu Battles and tagged Incineroar, Pikachu by dreager1. Bookmark the permalink.